BANGI, 3 July 2014 – Children in this country are not being protected as they should due to a lack of awareness and respect for children’s right. This was the consensus expressed at a forum on children’s rights held at the Persada Canselor in The National University Malaysia (UKM) here today. The forum discussed several issues including one delima faced by most parents which was highlighted – when to allow your children to be independent. The consensus was that most parents do not have a clue. Almost every parent attending the forum can be seen frantically reaching out for their phones calling to ask about their children in the course of presentations by the panelists. 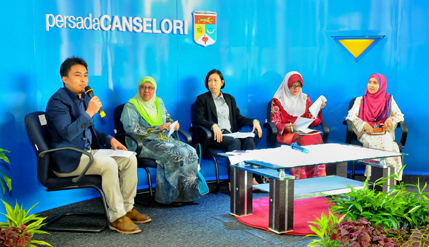 On the panel were Deputy Vice Chancellor (Students and Alumni Affairs) Prof Datin Nor Aziah Mohd Awal, Puan Rosmaini Ahmad from the Social Welfare Department, Dr Farah Nini Dusuki from Voice of The Children, an NGO and Superintendent of Police Ong Saw In. It was moderated by TV Al Hijrah host Wan Kamarudin Wan Ibrahim. The panelists had highlighted a number of very uncomfortable things about treatment to children by their parents or guardians. Cases of siblings burnt to death because their parents locked them in the house, children kidnapped because their mother is too busy cooking in the kitchen and toddlers drowned in the most unthinkable of places, like in a pail of water in their own bathrooms were some of the incidents involving children highlighted by the panelists. Some of the incidents include the case where a boy’s head was smashed to the wall by his own father with another boy strangled to death by a step father while one child suffered because of not keeping quiet and yet another for not going to sleep on time. The question raised was do they deserve such gruesome deaths for such behaviors which are hardly crimes? All the four panelists agreed that the level of awareness about children rights is still low in the country. For example it came as a surprise to many when Prof Nor Aziah, an expert on children’s right mentioned that it is illegal for children under 18 to be left without adult supervision, meaning that they can’t go shopping alone or with friends of the same age without adult supervision. That provision is violated every day even by professionals like lecturers or professors because they have to work. Thus it becomes common for siblings to pass their house keys to one another like a baton in a race. Thus they eat alone and live alone for long hours with supervision by an elder sibling who is also still below 18. She mentioned another legal requirement of keeping the identity of children suspected of being victims of physical or sexual abuse not being adhered to. She gave the example of the recent case where the photo and even video of a suspected abuse victim being uploaded onto social media sites. The more shocking thing is it is done by the authorities who rescued him. In such cases questions also arose whether putting such victims in a home run by the welfare department is the best option. The representative from the Welfare Department (JKM), Puan Rosmaini Ahmad said putting abused children in a home is made as last resort. The home, she said, are usually filled to maximum capacity. The welfare department will normally try to find a family or relatives who can give them the attention that they needed. She said parents of children with disabilities are required to register them with the welfare department so they can get the benefits they are entitled to. Dr Farah Nini Dusuki from Voice of The Children, an NGO said that it was difficult to ensure children have constant supervisions. Her own daughter, she said, takes three buses without adult supervision to get home from her boarding school. Dr Farah suggested JKM put in place a system to automatically register children with disability at birth whenever possible. She said Malaysia has enough laws to protect children but the problem is enforcement of the law. This is linked to the mindset and awareness among society. ASP Ong said police files shows that 70 percent of the perpetrators of child abuse are the parents, guardians or babysitters and are invariably related to work stress and financial problems. The moderator commented about the recent case of alleged child abuse discovered by immigration officers. In this case the mother had no choice but to leave her disabled son at home alone because she has to work to put food on the table. But the backlash and curses that she received on social media because of it made it look as if she had already been convicted of a heinous crime. However there was enough incidents happening requiring examination of the employers’ role in children being abused. They may be no direct link between the employer and incidence of abuses but they are the cause of over worked and underpaid employees. Vice Chancellor Prof Datuk Dr Noor Azlan Ghazali and members of the public attended the forum.